What a silent blog this has been – not at all what I intended for the summer. Since the last post, I’ve been in New York – Connecticut – New York – Connecticut – Massachusetts – Connecticut – New York… all in five days. Whew. But it was lovely to see all my mother’s family for a beautiful memorial service for Gram, and to tromp around the family homeland in NW Connecticut. Although I’ve never lived there, I do feel a connection to those verdant hills nestled like eggs in a basket, with their gurgling brooks and hard-won fields and white-steepled churches snug in the hollows. On Saturday we ventured north to Lenox, Mass for the wedding of college friends, then spent the night with my dear friend Lucia in her little old cottage. Sunday morning was our only spell of pure relaxation, reading the Sunday Times on her porch and watching the bees at work in the garden. I read the article about the hidden gardens of Paris and wished like mad to go traveling abroad. For now, the occasional family reunion will have to suffice, although Marika and I dreamed up plenty of trips to France and Hawai’i! Notable now when the family gathers are the little members of the next generation. As my brother and I are the youngest on both sides, we’ve now got quite a number of first-cousins-once-removed. And they’re hilarious. I give you the following anecdotes as proof. My cousin Rachel’s children weren’t at the memorial, but she told us an excellent story about her daughter (also 4). They went to a Lakers game, where Lulu approached a very tall man and said to him, “You’re almost as tall as my cousin Saxton!” The very tall man was Kareem Abdul-Jabbar. So naturally I’m thrilled that we’ve got even more cousin-sprogs on the way, and I’m knitting and quilting for them with great dedication. 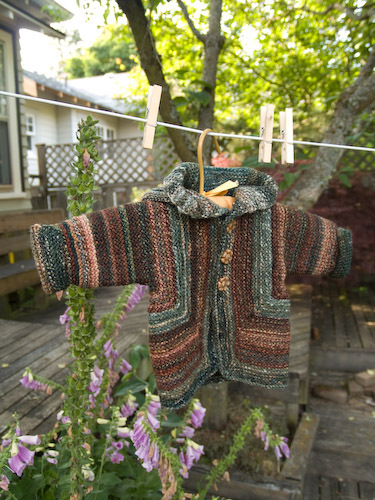 I love how many knitters can spot a Baby Surprise Jacket at a hundred paces, even when you only show them a corner of it. This little number will go to one of the two cousinlets postmarked Boston for August delivery. The yarn is Crown Mountain Farms Sock Hop in two colors: I’ve Got You, Babe and an unnamed mostly green skein. I couldn’t stop knitting with this stuff. 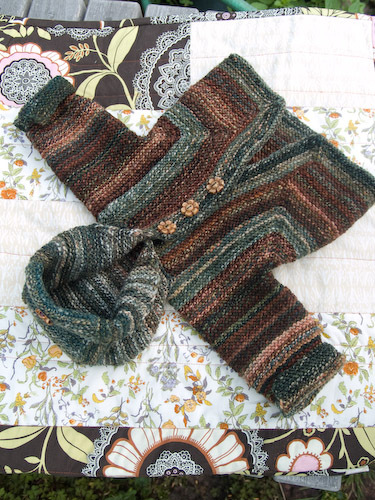 First I added a hood to use up more of the green, and then I decided I’d add some cuffs – in the end, I had only a yard or two left. I used US #4 needles, and unless the recipient is very large or very small, I anticipate s/he will be able to wear it through most of the fall and winter. I guessed about the hood size and construction, having no small babies on hand to measure. But I’ll post the directions and you can modify at will, because I think this little jacket is even more charming with a hood. Row 1: Pick up 62 sts along the whole neck edge of the finished jacket. Row 2: Sl 1 p-wise, k back across on the WS. On the RS, mark the st at the shoulder seam on each side. Row 3 and following 7 RS rows: Sl 1 p-wise, k to marked st, *m1, k marked st, m1,* k to next marked st and repeat * to *, k to end. Row 4 and following 7 WS rows: Sl 1 p-wise, k. 94 sts. Rows 17-28: Sl 1 p-wise, k.
Row 29 and following 7 RS rows: Sl 1 p-wise, k to marked st, ssk, k to st before next marked st, k2tog, k to end. Row 30 and following 6 WS rows: Sl 1 p-wise, k across, but p marked sts. 78 sts. Row 44a (WS): Sl 1 p-wise, k to 4 sts before marked st, *yfwd as if to p, sl next st, yarn back as if to knit, return slipped st to left needle, turn work and K back to front edge on RS. * You have “wrapped” one st and worked a short row. Row 44b (WS): Sl 1 p-wise, k to 4 sts before wrapped st and repeat * to *. Row 44c (WS): Sl 1 p-wise, k across, but p marked sts. When you meet the wrapped sts, use the left needle tip to lift the rear strand of the wrap, then k tog the st and its wrap. Row 45b (RS): Sl 1 p-wise, k across, but p marked sts to 4 sts before wrapped st and repeat * to *. Row 45c (RS): Sl 1 p-wise, k across, but p marked sts, working wraps tog with their sts as in 44c, to second marked st, k2tog tbl, turn. Row 46: Sl 1 p-wise with yarn in front, k to marked st, p2tog, turn. Row 47: Sl 1 p-wise with yarn in back, k to marked st, k2tog tbl, turn. Row 48: As Row 46. Now you are closing up the top of the hood by working only on the central sts and joining them to the side sts at the end of each short row. Continue to work as established: the side sts will gradually be consumed; the number of central sts will remain unchanged as the fabric grows toward the front of the hood. When 3 sts remain unworked at either side, work a yo for a buttonhole in the middle of the central section so you can fold the hood brim back and secure it on top of the baby’s wee noggin. Work the last 3 ridges and BO, slipping the remaining side st to begin and purling tog the last 2 sts at the end for a smooth edge. Secure ends, sew a button to the top of the hood, and there you have it! 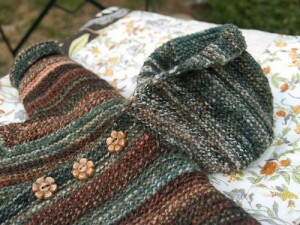 Add little matching split cuffs to the sleeves as a point of style if you wish. That is lovely! Great colors. Thanks for the hood directions, I may have to try that on my next BSJ. LUV the BSJ with a hood!! Thank you for writing up this mod! Luv the colors on the jacket too with the extra button on the hood. Just super cute! Ooh, that baby surpise jacket is gorgeous! I love the colours. The hood is such a great idea, too. Oy! I’m knitting a BSJ right now!! 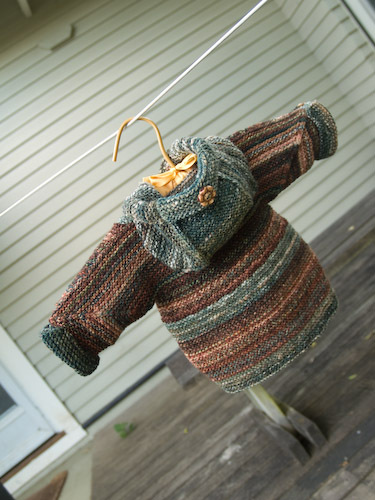 I just may have to add a hood with the yarn that I know I’m going to have left over…. i love the hood. you are one of those rare knitters that can take a brill pattern and make it just a bit better. did you say one of two cousinlets? twins? isn’t the mr. garter a twin? watch out, girlie, it seems to be in the water. Love the baby surprise and that hood! Genius! I love the hood. Great idea, and so adorable. 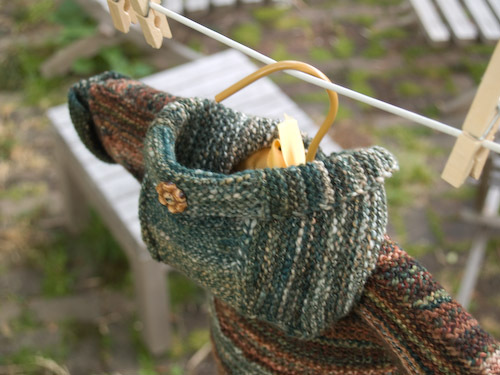 I’m bookmarking this post — I haven’t yet made a Baby Surprise, but I really want to knit one for my soon-to-arrive grandchild, and I think that hood is a delightful addition. I love the way you create simple and utterly convincing garments and make them seem simple! yikes, I meant, make them seem easy. Proof-read, I tell my students, proof-read! I love your bsj. the yarn is gorgeous! really nice…. have a great weekend! 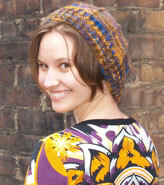 Once you have knit a BSJ they are easy to recognize – and I love your addition of a hood! I used to go camping in the Kent/Cornwall area, and I love that area – the rivers set into glacial valleys, the covered bridges, and all the stone walls. Man. So homesick now! The hood look so great on the jacket… I love what you did. Your travels sound amazing but, as you say, very busy – hope you have the chance to have some more real downtime soon! Happy 4th of July! EZ would be *so* pleased with your unvention! And I am delighted with that extra button on the hood. Charming! Lovely earthy colours for the winter, the hood makes an adorable addition. Ice cream and a new president. I’m dying laughing over here. That jacket is also to-die-for gorgeous! I’ve never made one, and have always admired their many incarnations, but I think this is the one that is going to push me over the edge. I think the hood has done me in. 😉 Thanks, Sarah! oooh! i love the added hood! great idea! it’s just what was missing from that sweater. That is just adorable! I love the clever addition of the hood, and the jacket looks amazing in the Sock Hop yarn. I’m sorry I didn’t realize you’d be visiting my little corner of the country, though it sounds like you were very busy! Perhaps next time we can have some tea and a quick trip to the yarn shop. I love the hood for the BSJ and the colors are so nice. Love it with the hood. Going to do one just like it while on vac this week. I love the colors of your beautiful BSJ! i love that bsj. oh how i adored knitting bsjs a little while ago. i will never get over the meaning of sprog in english. in danish it means language. and i used to work in a sprogskole where i taught adults sprog. so funny.